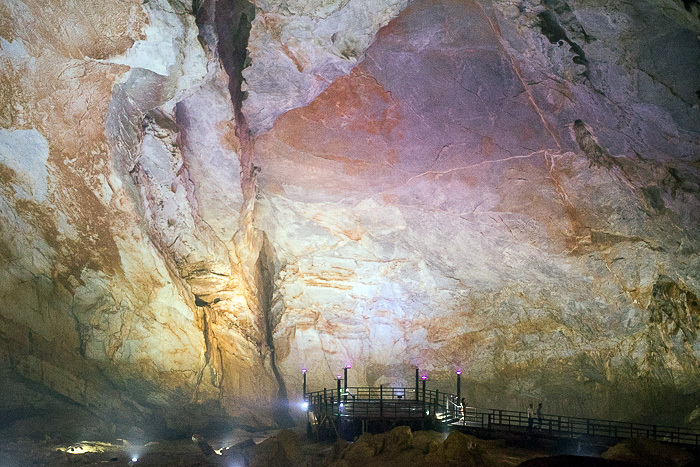 The visitor’s path is only one kilometer in length, but the cave itself stretches on for over thirty, making it the longest dry cave in Asia. 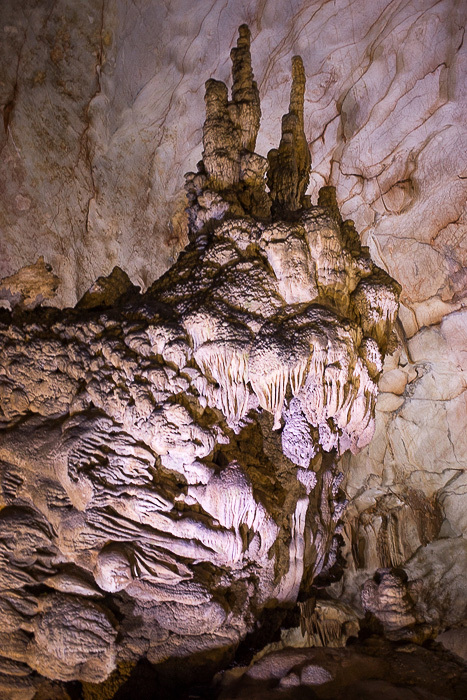 Paradise Cave was just discovered in 2005, by a local who heard wind whistling out of the rock. 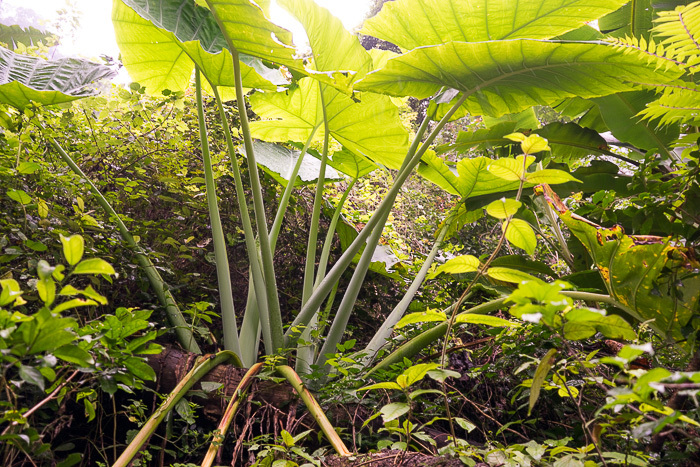 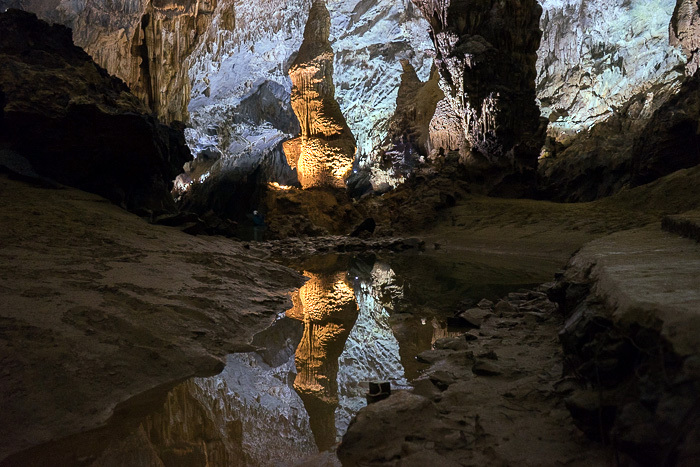 That sounds incredible, but once you see the entrance to the cave… an inconspicuous hole in the side of a mountain, deep within the park, it’s easy to understand how it went undetected for so long. 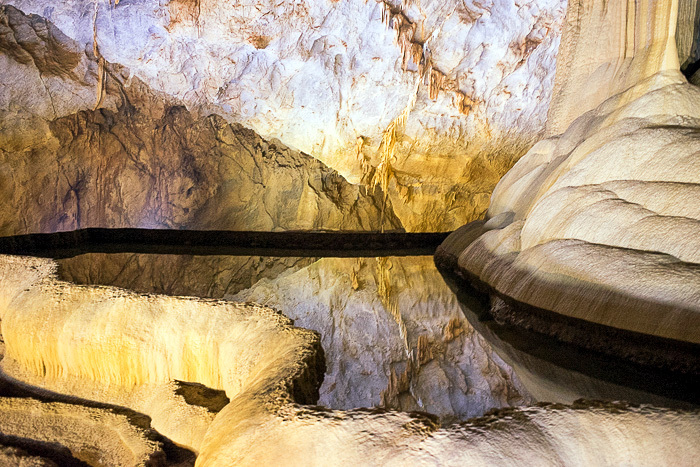 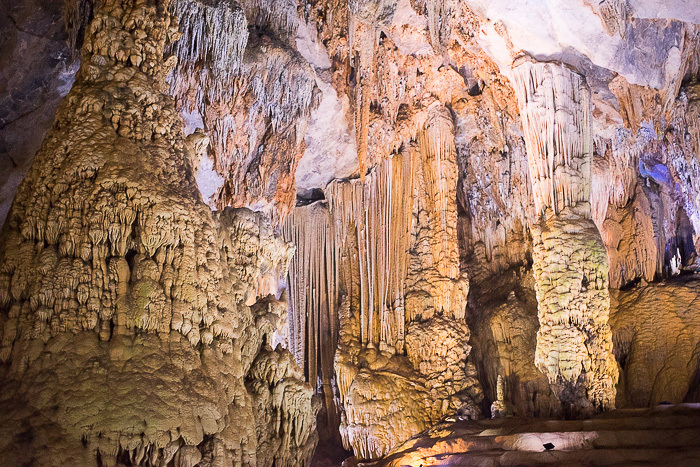 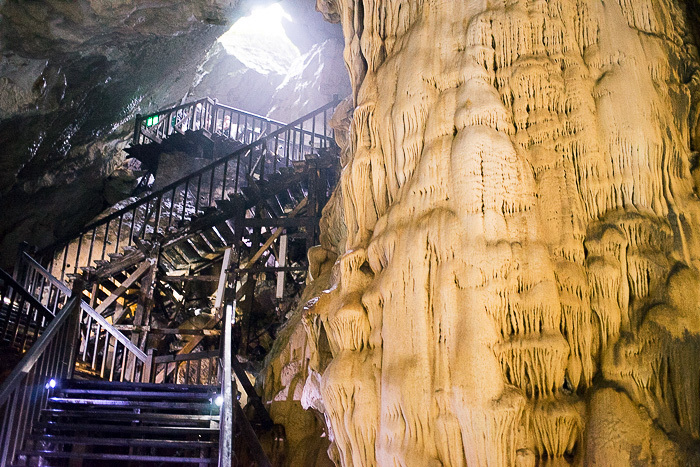 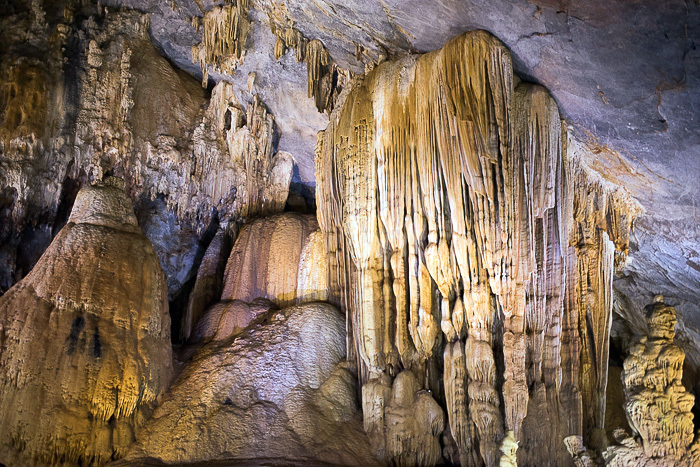 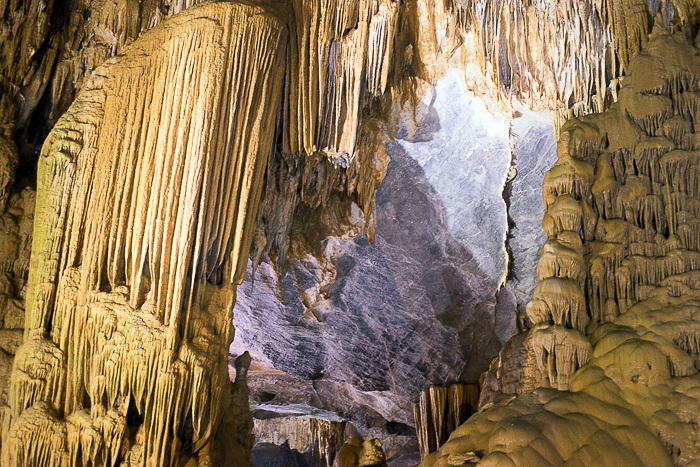 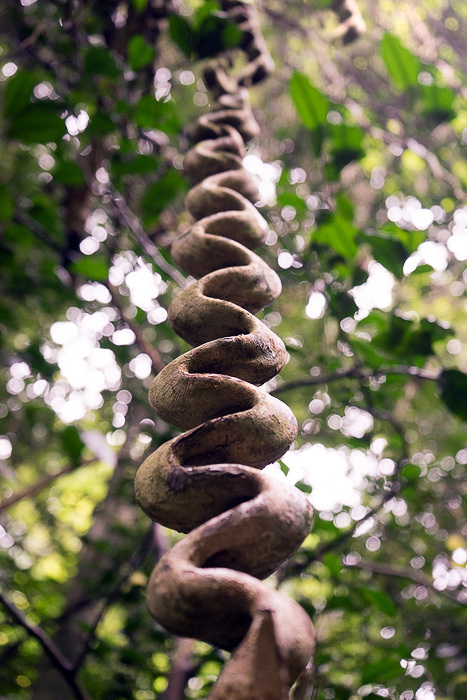 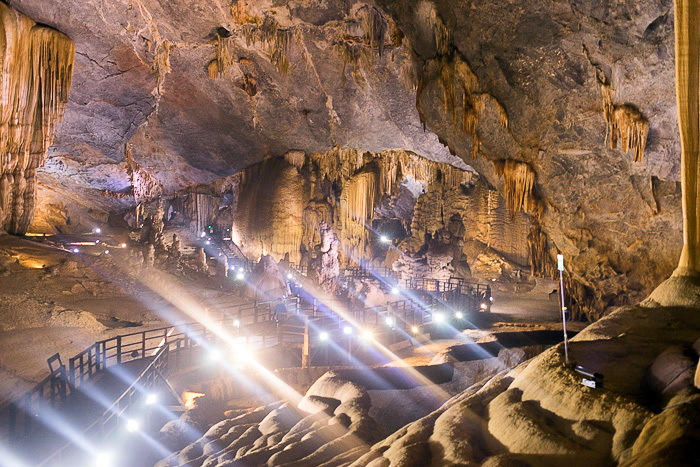 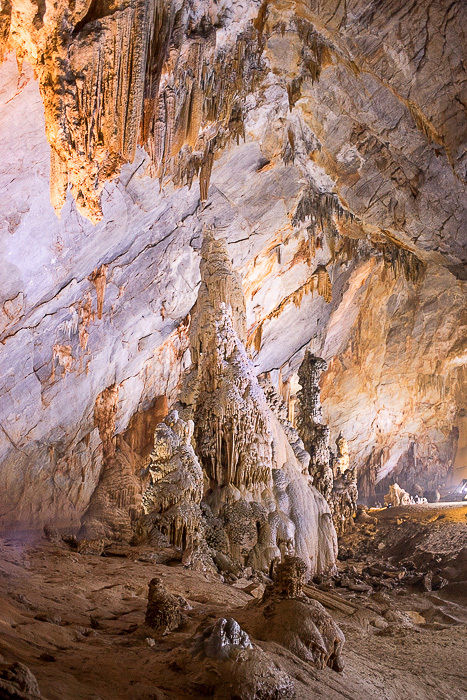 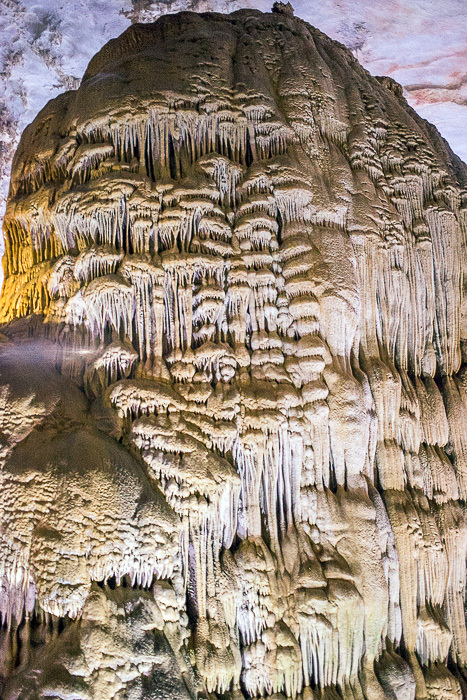 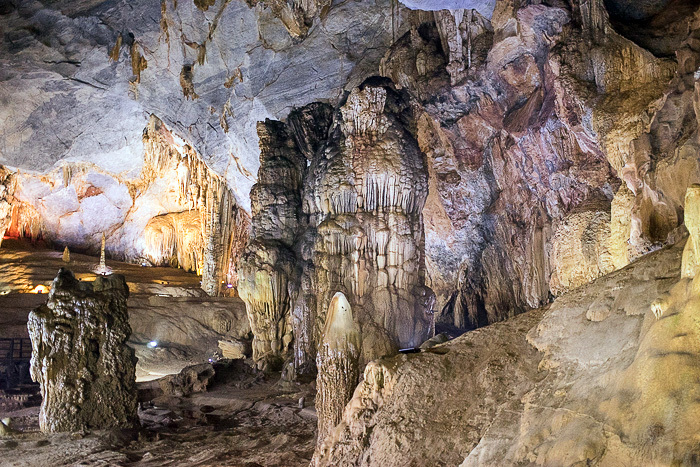 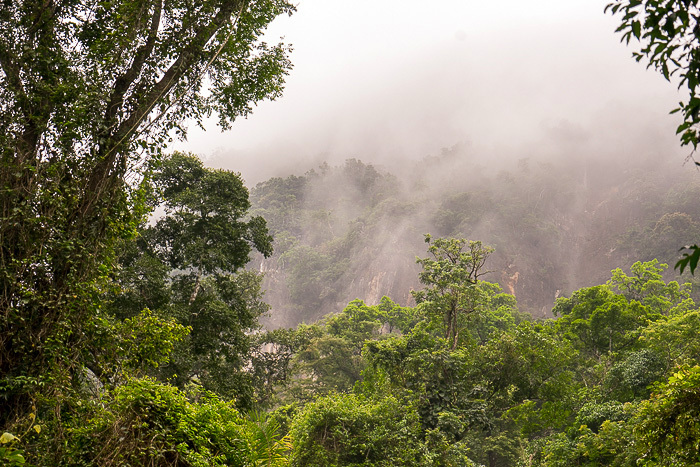 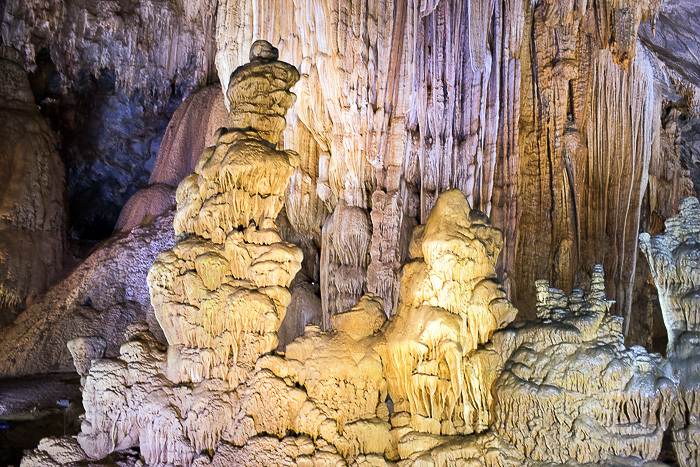 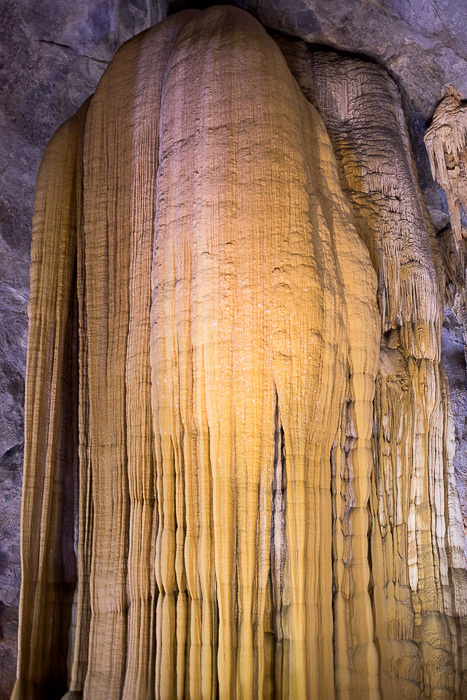 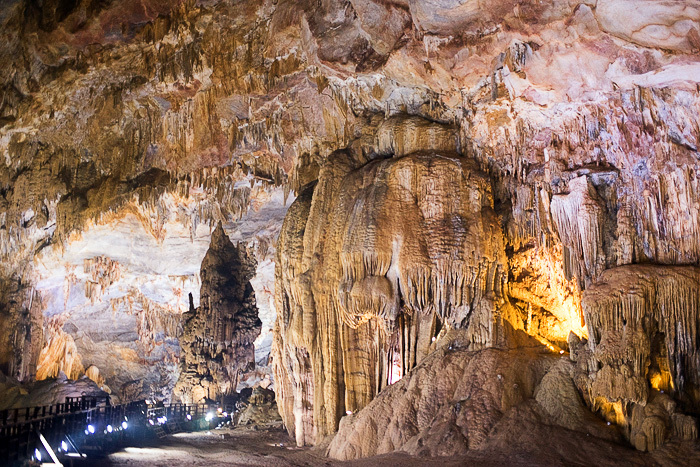 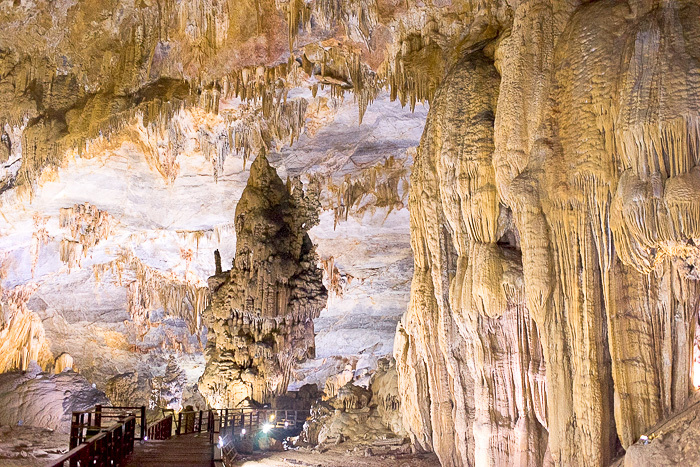 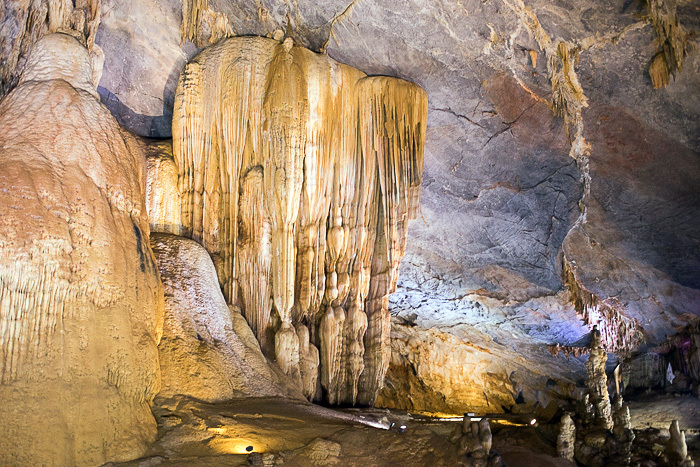 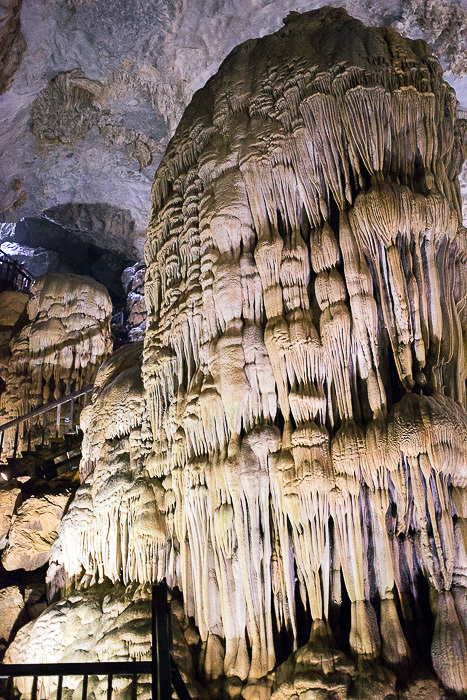 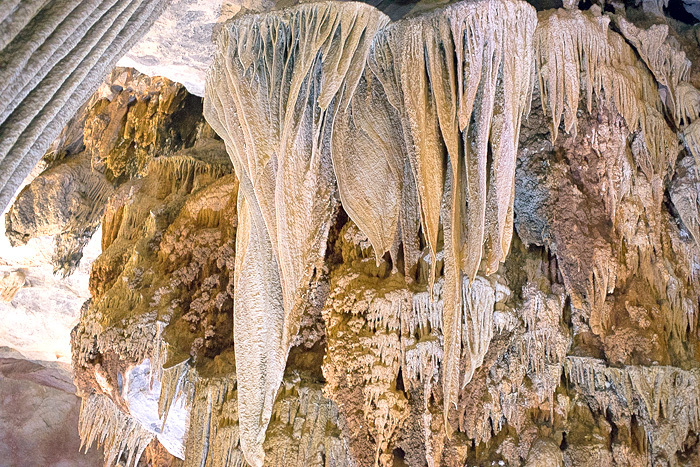 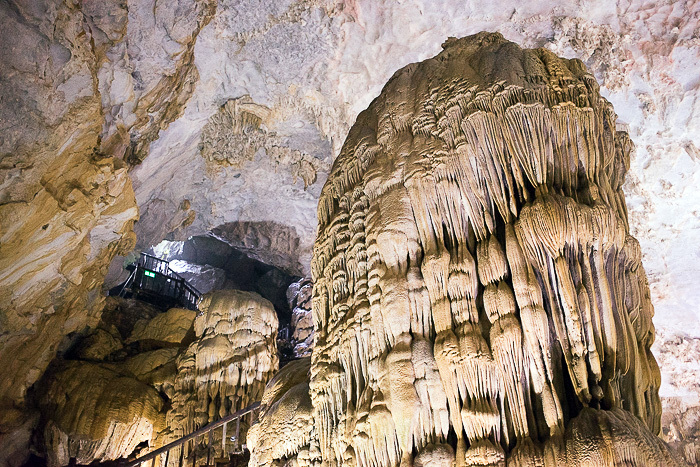 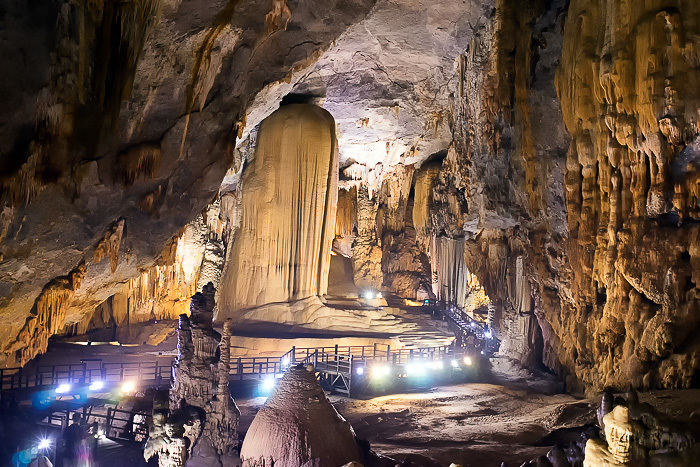 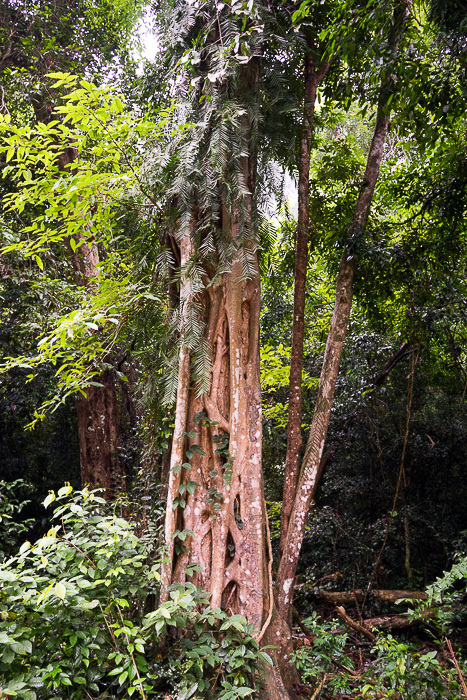 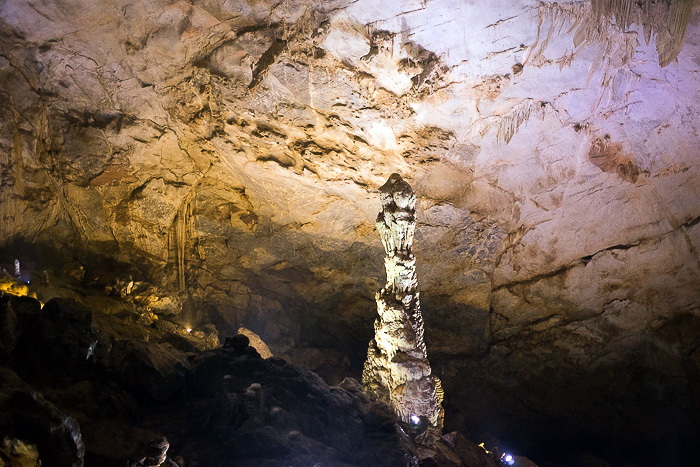 A team of British speleologists were invited to explore; awed by its incredible length, the formations and the size of its chambers, they christened it Thiên Đường, or Paradise Cave. 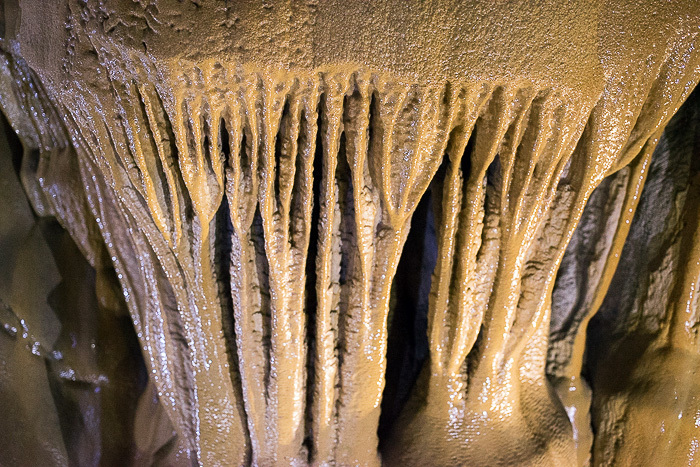 That might sound hyperbolic… until you’ve stepped inside, yourself. 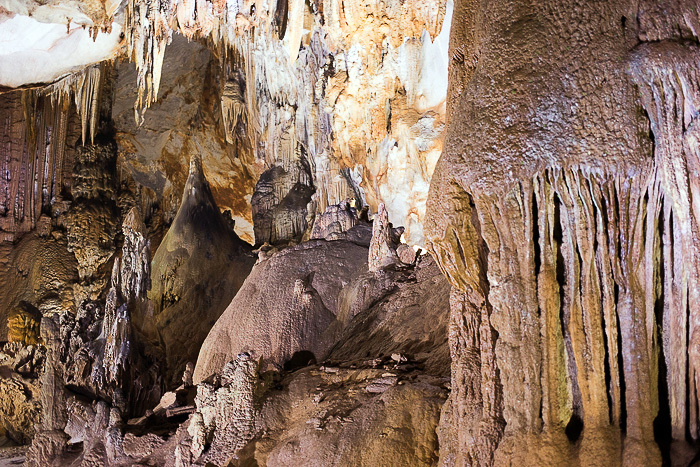 Reaching Paradise Cave requires an effort, but there are a few options. 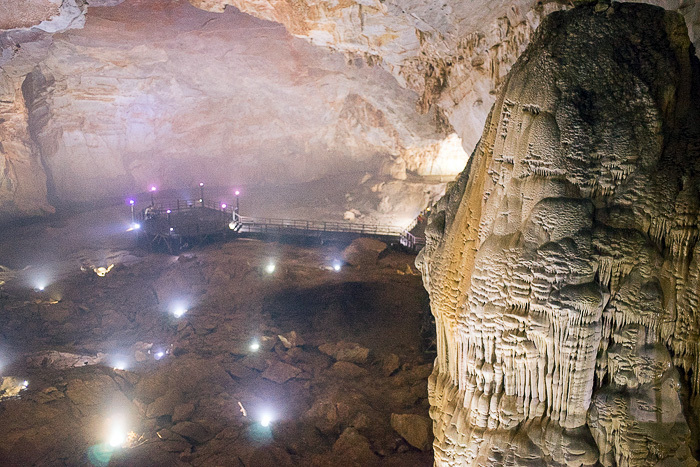 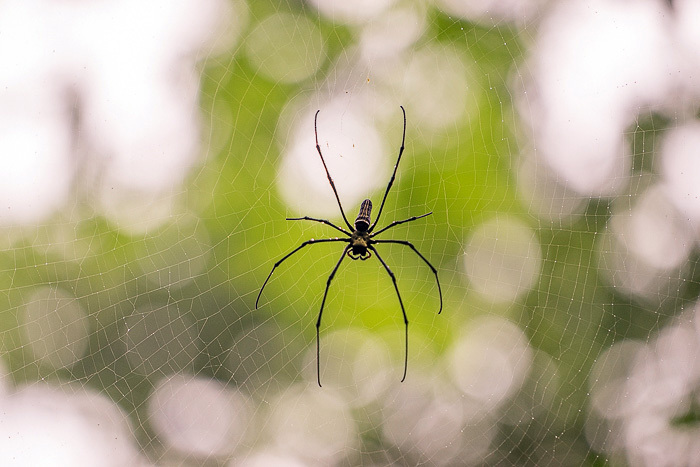 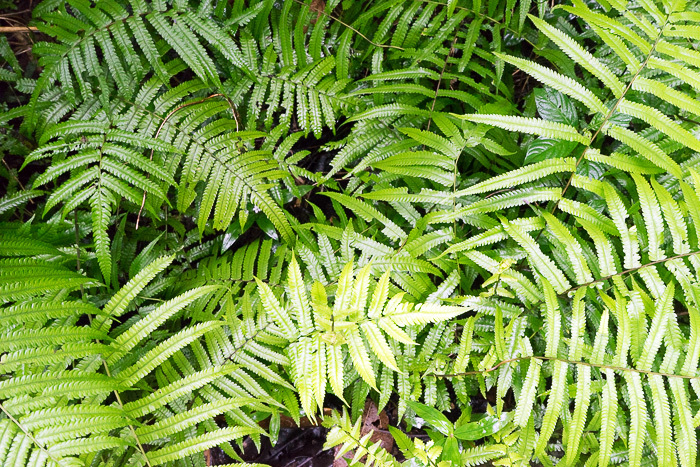 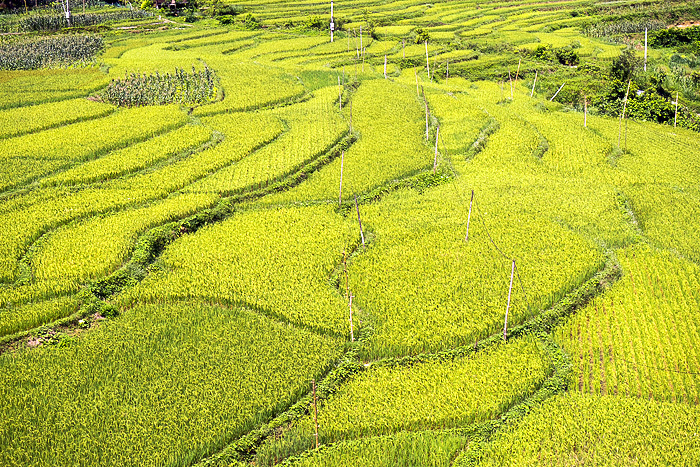 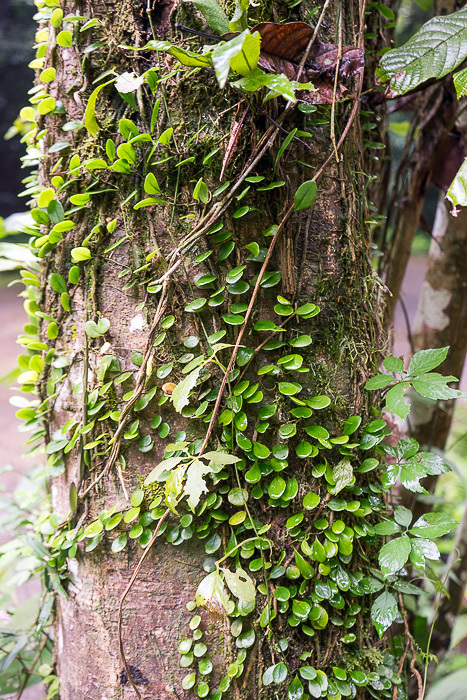 Most visitors arrive as part of a tour, leaving from Phong Nha Village, but we found these to be prohibitively expensive. 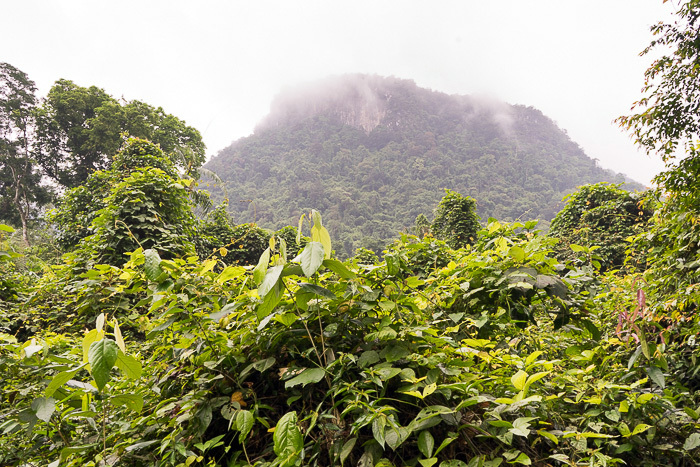 The best and cheapest way is to rent your own motorbike, but you can also hire a driver to take you there for around Đ250,000. 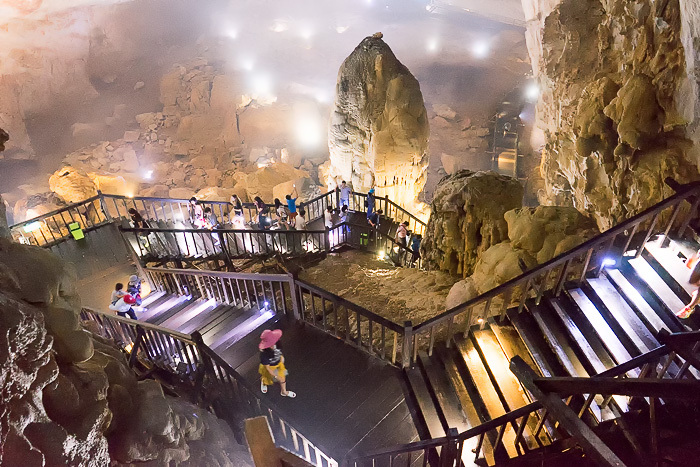 Entrance to the cave is the same price. 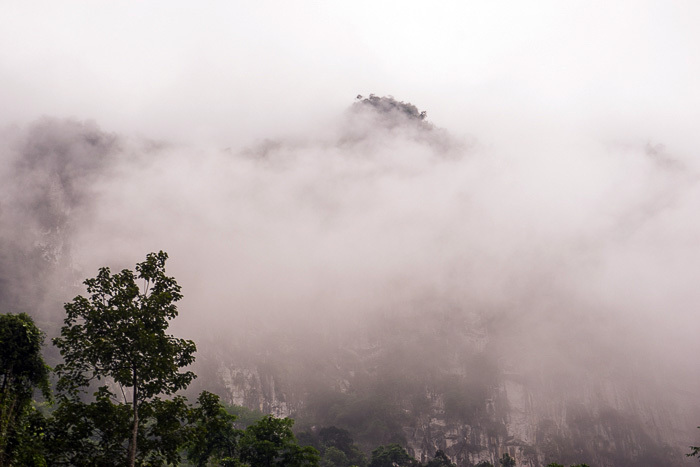 It tends to be more crowded in the morning, so if you show up around noon, you’ll have more peace. 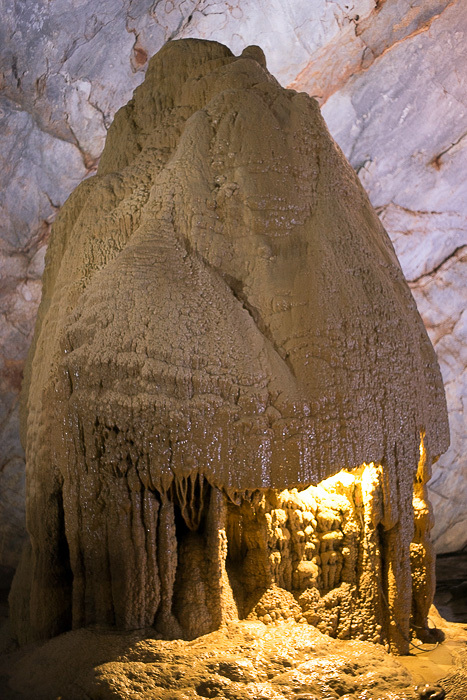 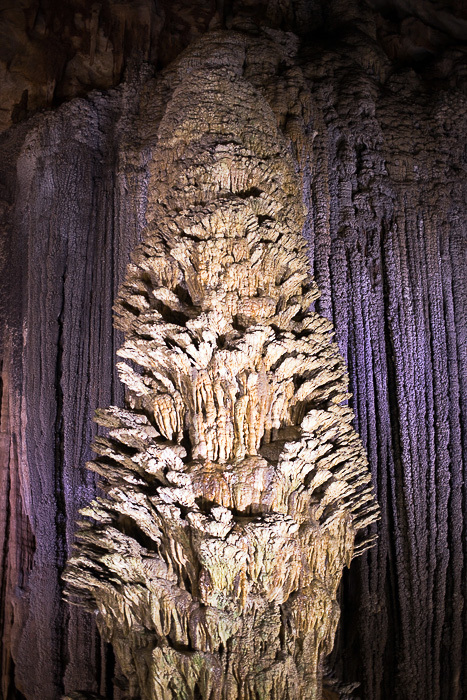 Despite being restricted to a fraction of its total length, you could spend hours inside this cave. 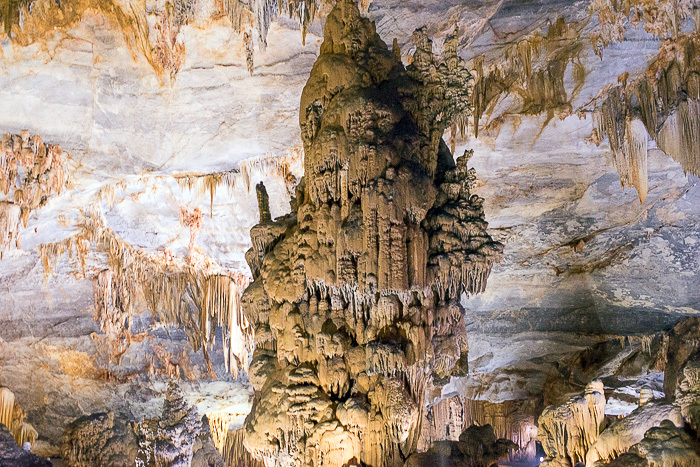 The dimensions of its rooms, particularly the first cathedral-sized chamber into which you descend, are mind-boggling, and the multi-colored formations are beautiful. 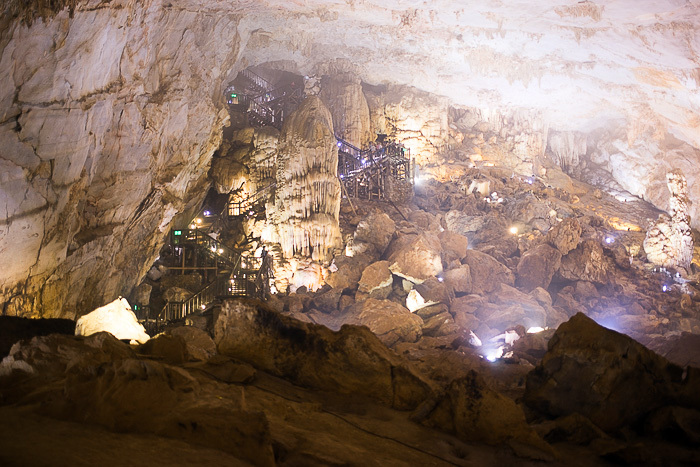 The LED lighting can be somewhat irritating, but photographers will be in paradise… happy. 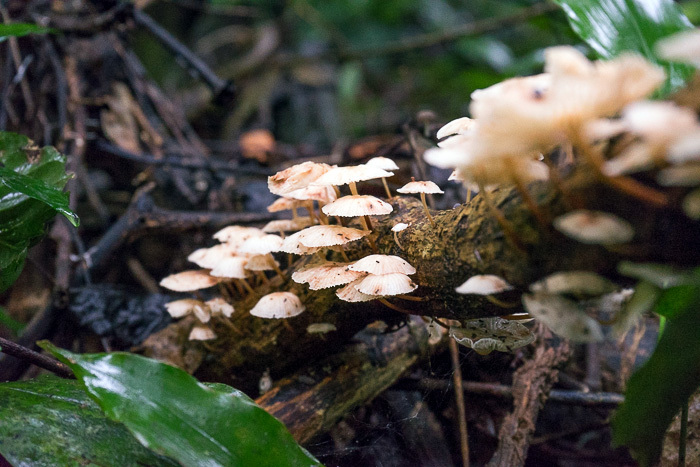 They’ll be happy.